We are engaged in offering ceramic fiber rope for hight temperature static seals which is used for high temperature static seals like door joint or gaskets in flanges. The High Temperature Seal for Petrochemicals provided by us is used in various high temperature applications. Applications: Used in Paper, Plastic & Pharmaceuticals Industries. Our company has achieved widespread recognition in field of providing High Temperature Oil Seal to our reputed clients. Our offered High Temperature Oil Seal is extensively used in hydraulic and pneumatic systems, and non-automotive applications. It is manufactured by using quality raw material as per the industrial standards. We also offer high temperature metal bellow seal with unique designs to handle corrosive and abrasive media. Application of quality raw material such as carbon, PDFE, TC and carbide. Metal bellow seal is used in areas such as petrochemicals, sugar, paper & pulp industries. 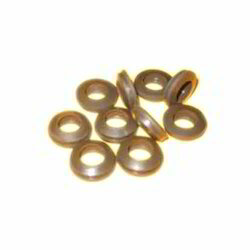 Professionals use best machines for the manufacturing of these High Temperature Seals. Showing longer life, offered seal is safe from high temperature. 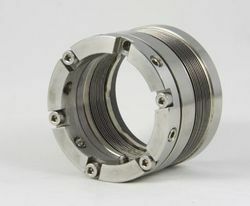 Moreover to this, these offered seals are breakage free. Professionals ensure quality of this seal before presenting in market. We are the leading manufacturer, supplier and importer of Ceramic Fiber Rope. These ropes are used for High Temperature Static Seals. Available in various thickness, sizes and other specifications, we are able to offer our clients with an extensive range of High Temperature Rubber Seals. These are known for their high pressure and temperature bearing capacity, tensile and elongated strength. We provide our customers an excellent quality range of Ceramic Fiber Rope. These Ceramic Fiber Rope are used for High Temperature Static Seals. With years of practice of this realm, we are capable to present a comprehensive series of High Temperature Seals. Due to top features, these are extremely admired.